Fabio and I visited Peru in May of 2015. I kept notes, but never wrote about our trip and am just going through the loads of pictures I took while we were there. I know, I know, but it’s better late than never. We had an amazing time and I wanted to share our experience. Hopefully you’ll enjoy the story of our trip and maybe you’ll be inspired to visit the beautiful country yourself. We flew direct to Lima from Fort Lauderdale, arriving late at night, we checked into a hotel near the airport in kind of a shady neighborhood with a very agitated dog that barked all night. Awaking early the next morning we caught a quick flight to Cuzco. 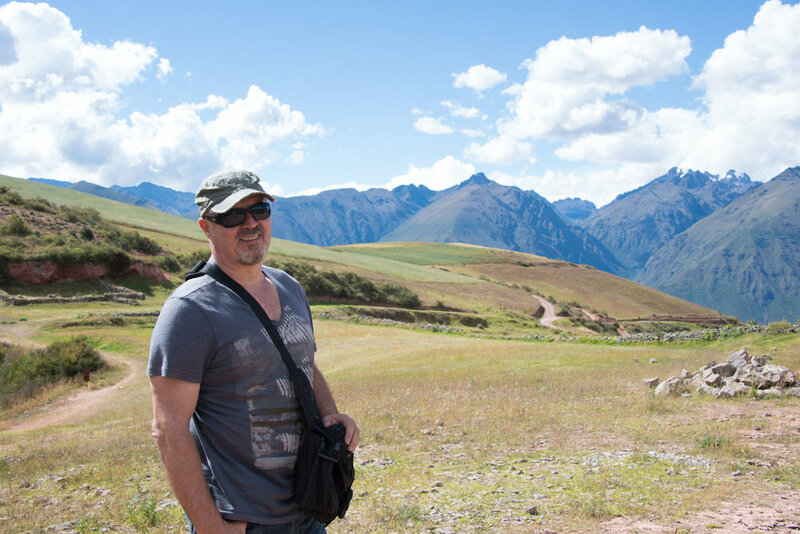 I had arranged for Percy Salas, a local guide I found through Trip Advisor, to pick us up at the Cuzco airport and show us the highlights of the Sacred Valley. 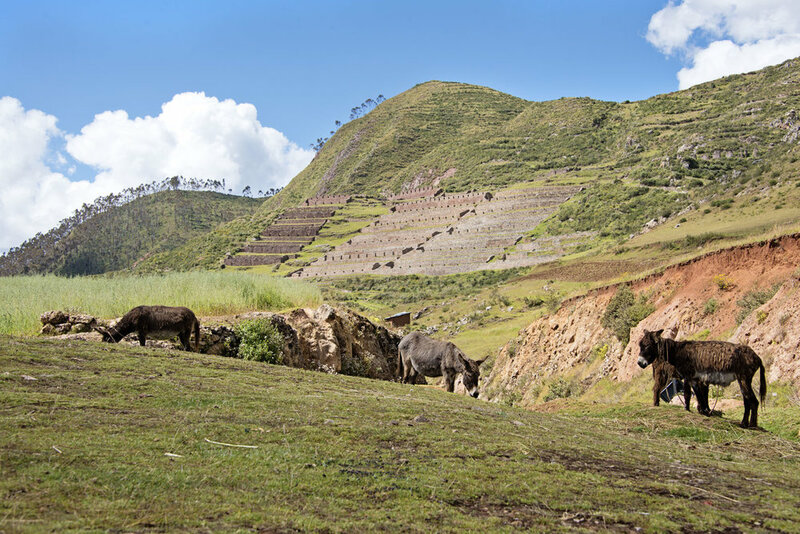 We were amazed by the beautiful, vibrant green mountainous countryside. I’m not sure if it’s because we live in super flat South Florida, but a rugged, mountainous countryside takes my breath away every time. 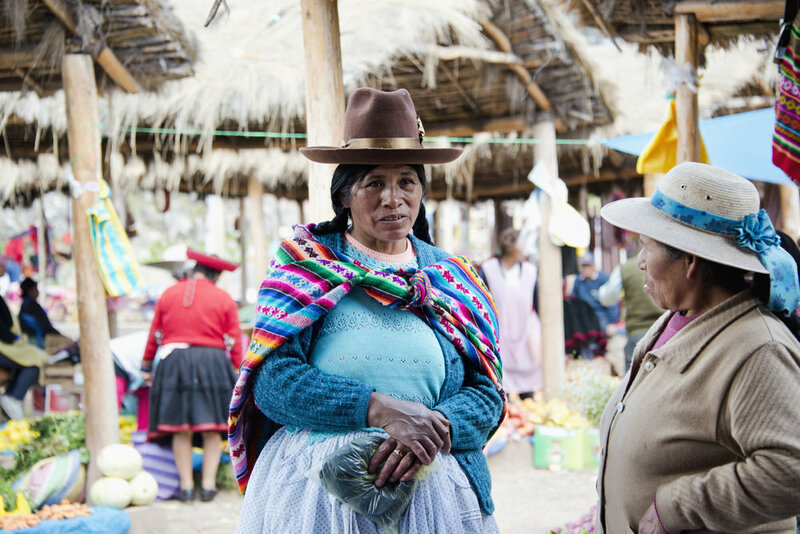 The first stop of the day was the weaver’s center in Chincheros where the Quechua women demonstrated the entire weaving process, something that has been passed on for generations. They first washed the shorn wool in soapy water made with a local root, combed it and set it aside to dry. A woman then began concocting natural dyes, first creating a deep red by crushing a dried cochineal bug. She then squeezed lime juice on the red colorant, creating a vibrant poppy hue. Rubbing the original red liquid with a piece of limestone created a vibrant fuchsia. 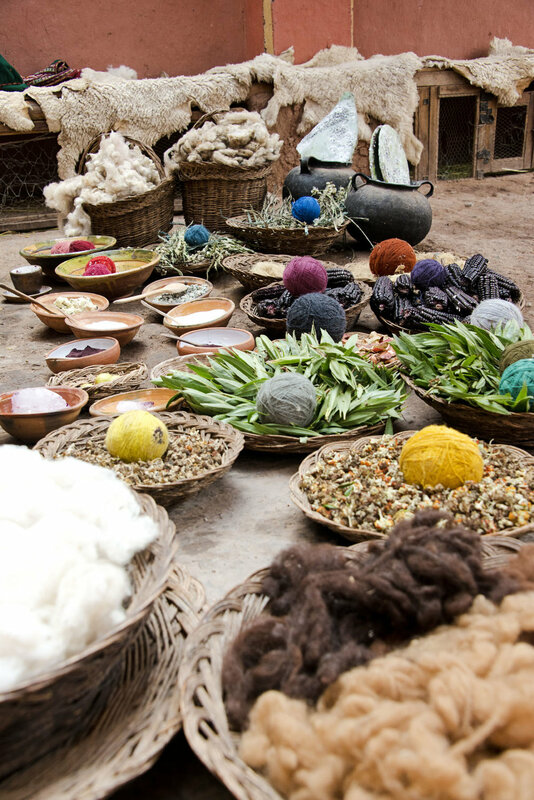 Once the pots of dye were ready the women dipped & dyed wool that had been spun into yarn to create the base for their vivid textiles. 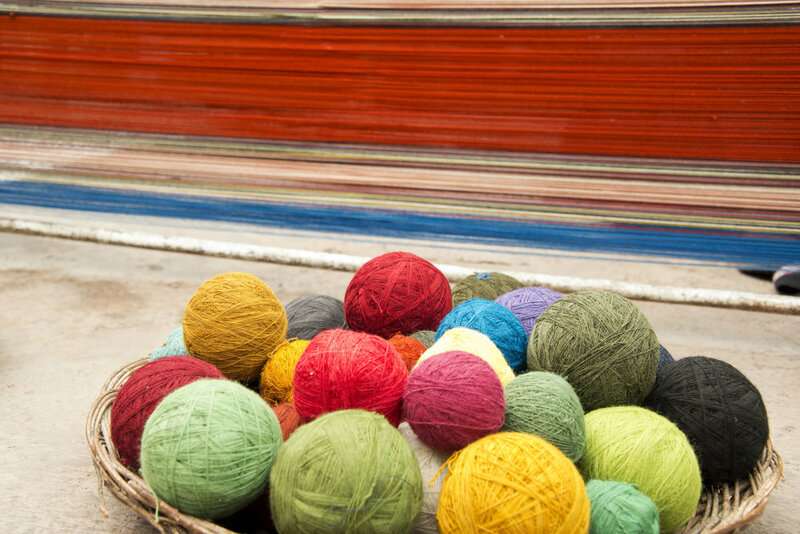 The colored yarn is then rolled into balls until needed for weaving. The women explained that every detail of a textile conveys meaning, from the colors to the woven symbols. Popular Quechua symbols are inspired by nature and folklore. 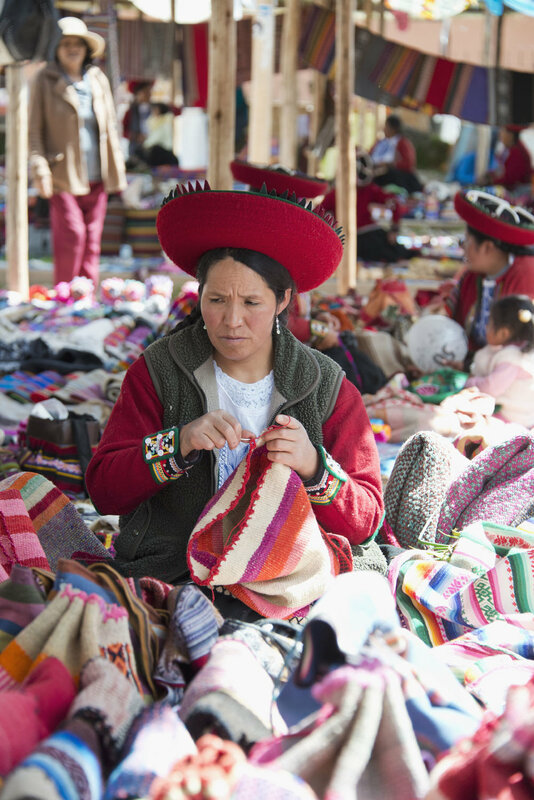 Llamas, dogs, the sun, water, historical events + characters are often seen in Andean textiles. 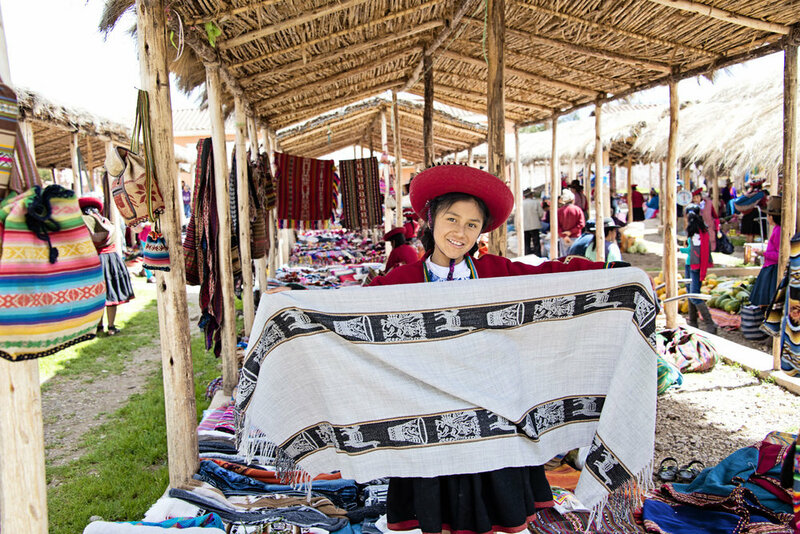 While researching the topic I found a beautiful statement on Threads of Peru; “Traditional textile patterns honor the Pachamama, (Mother Earth), and express thankfulness for growth, regeneration, and interconnectedness with the natural world. “ This knowledge makes the beautiful textiles even more special. 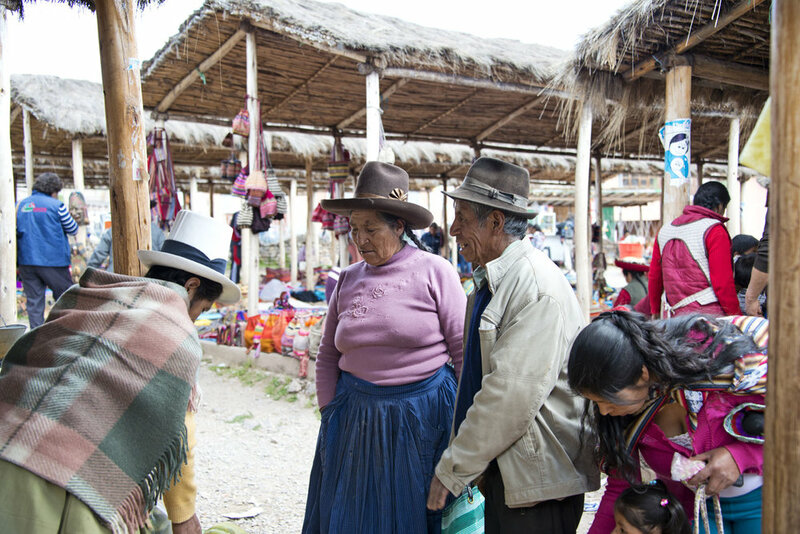 Percy then brought us to the Chincheros market to explore the vendor stalls of textiles, local crafts + food. Many people were selling a snack of boiled ears of corn with a type of white cheese in the shape of thick disc. The corn is similar to what you see in the U.S., but with massive kernels probably about 10 times the size of a common corn kernel. I of course had to try it, but Fabio steered clear, being the ever-vigilant safe traveler. I suppose that’s why I tend to be the one with “Travelers Stomach”, lol. It was a tasty snack but way too much. I felt terrible throwing the remainder away, so we saved it after consulting with Percy. He assured us we would find a hungry mouth along the way that would really appreciate the snack. Sure enough, we did find a young boy herding sheep, who gladly accepted the corn and cheese. 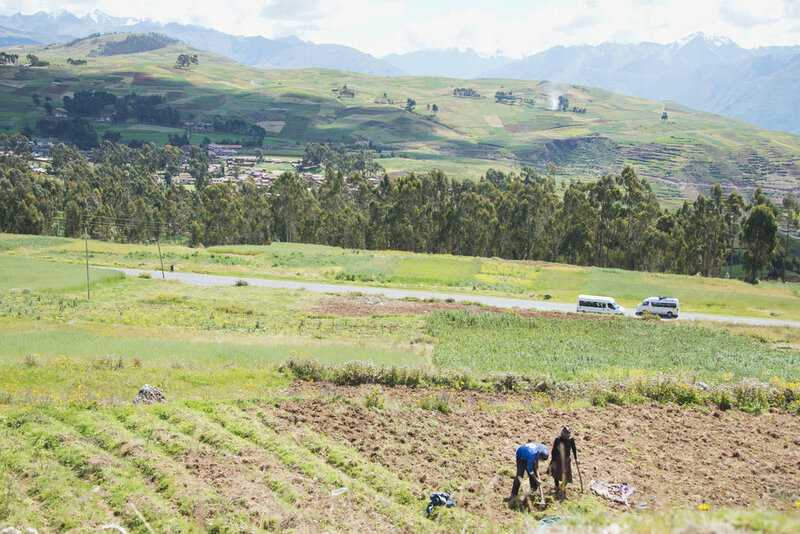 The Moray experimental farming terraces were the next stop on our journey. 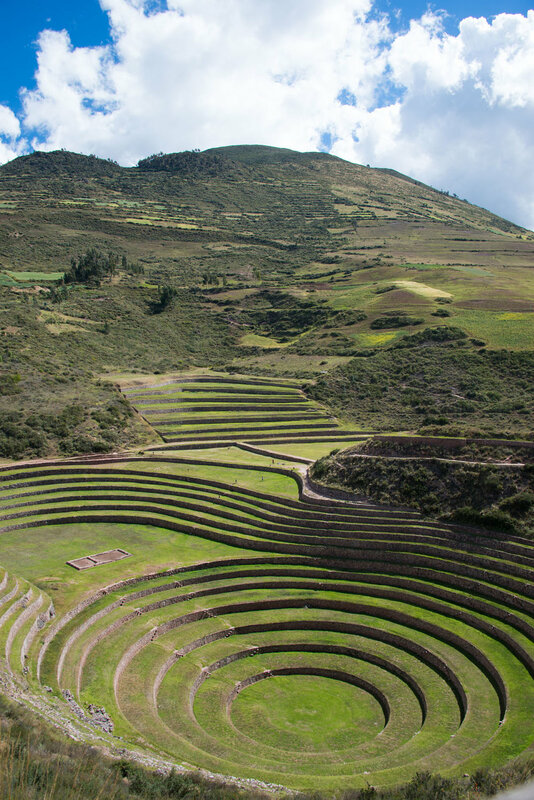 An archeological site with concentric terrace steps, which was most likely used by the Incas to test growing crops on the various elevations. Surprisingly, the temperature varies enough from the top step to the center so much that it could affect crop growth. My personal interest came from an artistic perspective, and I worked to capture Moray’s circular terraces from the perfect camera angle. The countryside is so beautiful we had to sop along the way for photo ops. I even managed to capture a barefoot woman harvesting potatoes. 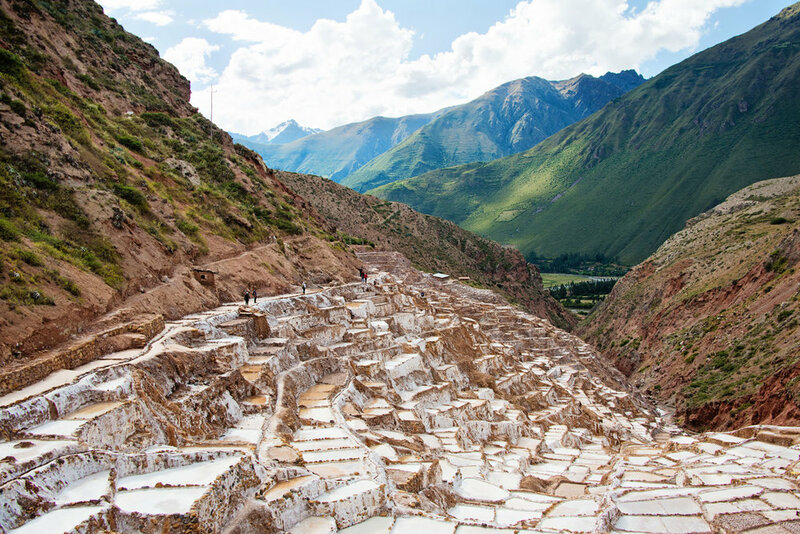 The Maras Salt Pans were the last stop of the day. 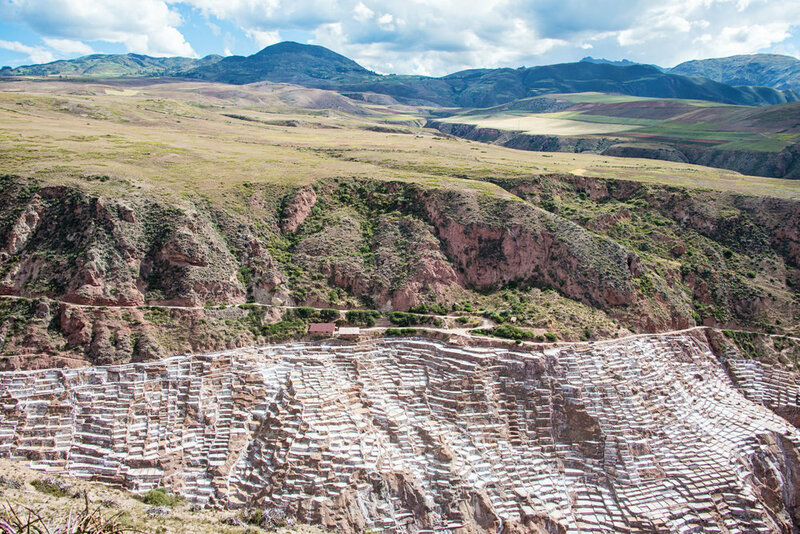 Hundreds of shallow troughs with varying degrees of salt drying in the sun are nestled into the vibrant green mountains of Maras. Water trickles through the crevices of the mountains, collects in the shallow troughs where it evaporates in the strong sun leaving a thick layer of salt. 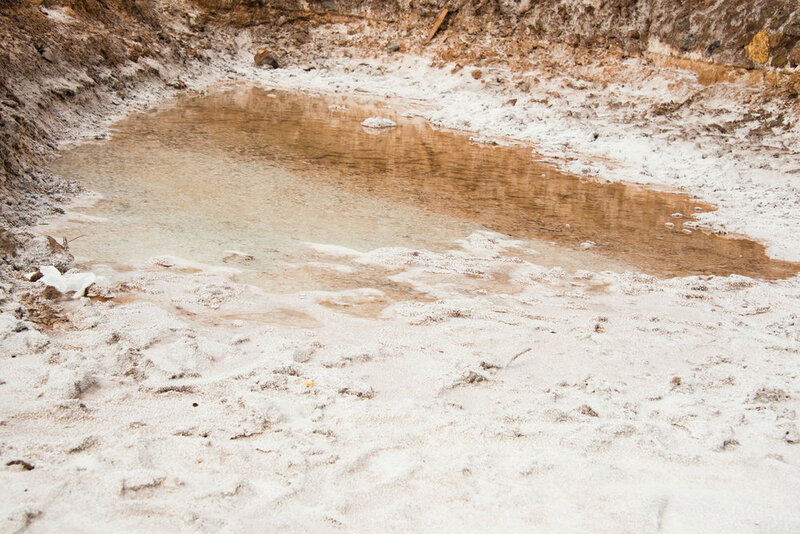 To this day, the salt pans are still hand harvested as it’s impossible to maneuver heavy equipment in the tricky terrain. 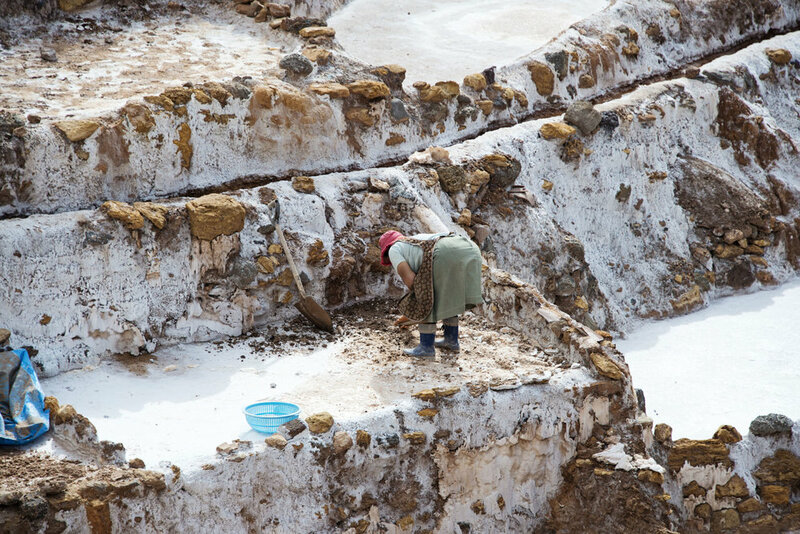 We explored the site for a while, weaving in and out of the salt pans, careful not to step in any. I had never seen anything like it, and Maras unexpectedly left quite an impression. I’m fascinated by nature’s geometric patterns so Percy + Fabio patiently waited while I took about a million pictures. We drove from Moray in search of our lodging in Urubamba, Arco Iris del Puente. Percy wasn’t familiar with the place, but we had the address and soon came upon a sign with the hotel’s name directing us down a small dirt road. Not far down the road, a fence bore a sign with the name of the bed & breakfast style lodge. We rang the bell at the gate + a young woman with a confused look upon her face greeted us. She had not received our reservation from Booking.com but fortunately did have a room available at her cute lodge that rested by a stream at the foot of the mountains. For once, luck was kind of on our side. And I learned to be extra sure I receive a reservation confirmation from the actual hotel and not just Booking.com. We thanked Percy for an amazing day and retired to our room for a nap before dinner. After lying down, a severe headache, the worst I’ve ever had, enveloped my brain. Suddenly, I felt sick to my stomach and before I could make it to the toilet I projectile vomited all over the bathroom floor. The sinking realization that I had altitude sickness, caused my thoughts to race in between hammer strikes inside my head. Oh no, I hope this doesn’t last long, I hope it doesn’t ruin our trip, I hope I can still go hiking. I knew we should have stopped for cocoa tea. I’ll spare you the remainder of the details, but the kind owner of the hotel did give us cocoa leaf tea, I popped as much Alleve as recommended and in the morning I was able to enjoy an amazing breakfast of homemade bread, jam + the best eggs I have ever tasted. Not only was I relieved not to be sick, but also that I was hopefully now adjusted to the altitude for the remainder of the trip. 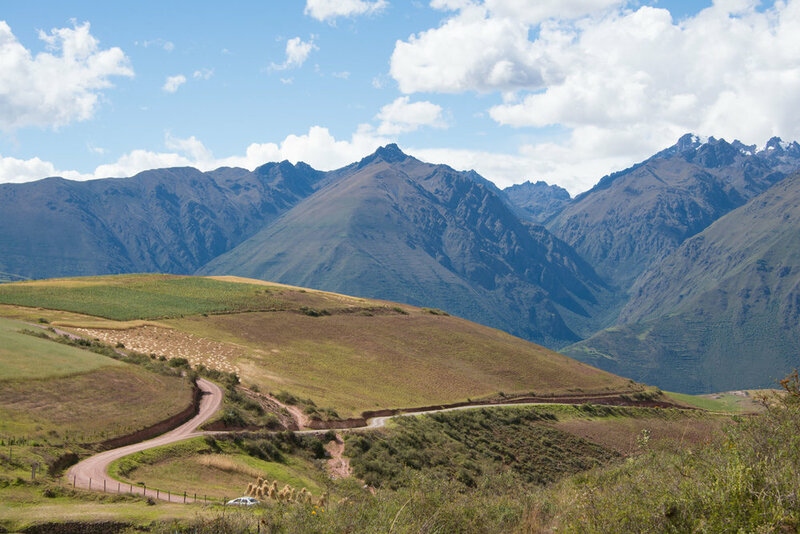 Stay tuned for next week’s post that will take you on the 3 day, 2 night Lares Trek through the Sacred Valley of Peru. 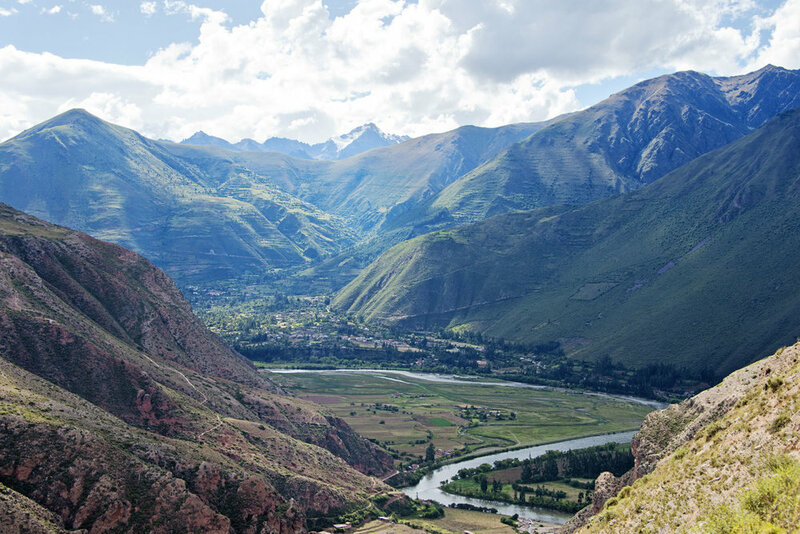 In the meantime, follow @kpotenti on Instagram for more inspirational travel photos of our Peruvian adventure.